THE B-MOVIE NEWS VAULT: On January 24th, Arrow Video's got a BLOOD RAGE that cannot be sated! On January 24th, Arrow Video's got a BLOOD RAGE that cannot be sated! 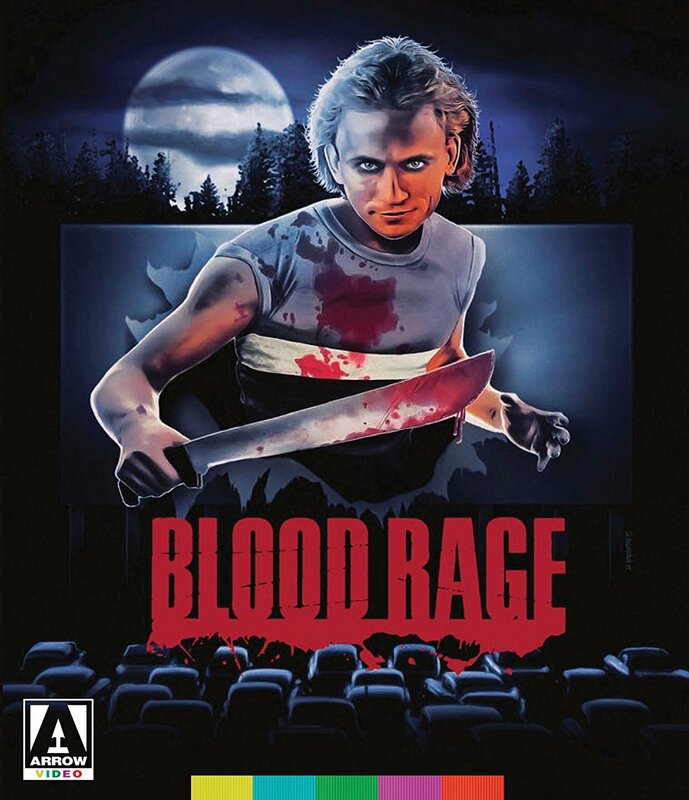 NEXT TUESDAY, ARROW VIDEO RELEASES "BLOOD RAGE" IN A 2-DISC SPECIAL EDITION! If you missed out on Arrow Video's Limited 3-Disc release of BLOOD RAGE, then take heart because you can still enjoy the film with a large selection of extras in this 2-Disc Special Edition. I'm down for this, because it's one of the few slasher flicks from the '80s that I've missed out on! Synopsis: What do you get if you combine Thanksgiving, American TV star Louise Lasser (Mary Hartman, Mary Hartman), killer '80s synths, and some truly gruesome special effects courtesy of Ed French (TERMINATOR 2: JUDGEMENT DAY)? Why, it's BLOOD RAGE of course! Twins Todd and Terry seem like sweet boys that is, until one of them takes an axe to the face of a fellow patron at the local drive-in. Todd is blamed for the bloody crime and institutionalized, whilst twin brother Terry goes free. Ten years later and, as the family gathers around the table for a Thanksgiving meal, the news comes in that Todd has escaped. But has the real killer in fact been in their midst all along? Shot in 1983 but not released until 1987, BLOOD RAGE is a gloriously gruesome slice of '80s slasher heaven now restored from the original negative for its world Blu-ray debut! Brand new 2K restoration of the ''hard'' home video version, transferred from the camera negative and featuring the original title card SLASHER! Audio commentary with director John Grissmer. Both Sides of the Camera - An interview with producer/actress Marianne Kanter. Double Jeopardy - An interview with actor Mark Soper. Jeez, Louise! - An interview with actress Louise Lasser. Man Behind the Mayhem - An interview with special make-up effects creator Ed French. Three Minutes with Ted Raimi - An interview with actor Ted Raimi. Return to Shadow Woods featurette revisiting the original locations in Jacksonville, Florida. Motion still gallery featuring rare behind-the-scenes make-up photos. Reversible sleeve featuring original and newly commissioned artwork by Marc Schoenbach! Essentially, this release is missing the second disc from the 3-Disc Limited Edition that came out in November 2016. Because of that, you're only getting one version of this slasher flick, rather than three (shorter theatrical cut and composite cut). Still you get the "hard" home video version, and a plethora of extras, so this is still a worthwhile release. Arrow's 2-Disc Special Edition of BLOOD RAGE streets on Tuesday, January 24th, so be sure to order it now from AMAZON or BULLMOOSE!